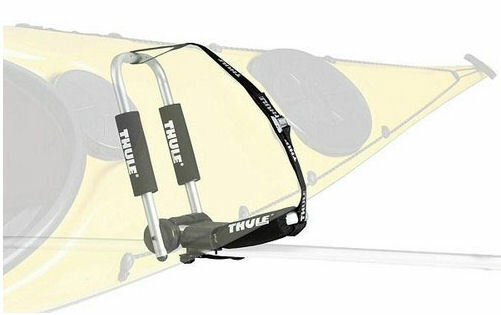 The Hull-a-Port Pro 837 is the fold flat version of Thule's 835-1 successful angled kayak carrier. When not carrying a boat the upright portion of the carrier can be laid flat, meaning it is not necessary to completely remove the carrier when passing under height restrictions. The Hull-a-Port Pro 837 allows boats to be cradled securely on their side, making it easier to load and beneficial for kayaks of more delicate construction. Its stable, space-saving design keeps the kayak firmly secure on top of the car. Its padded bars keep the kayak from being damaged during transportation. As well as rubber pads around the strap buckle protect the kayak and car from scratches during loading and transport. Suitable for both standard & aero bars. 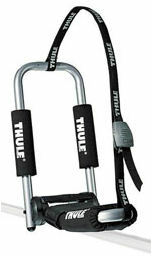 Come complete as a pair with 2 x 2.75cm Thule Straps. Angled design for ease of loading and transport. Protective pads around bars ensure the kayak is protected from scratches & damage. Comes complete as pair - Includes 2 x 2.75m Straps. 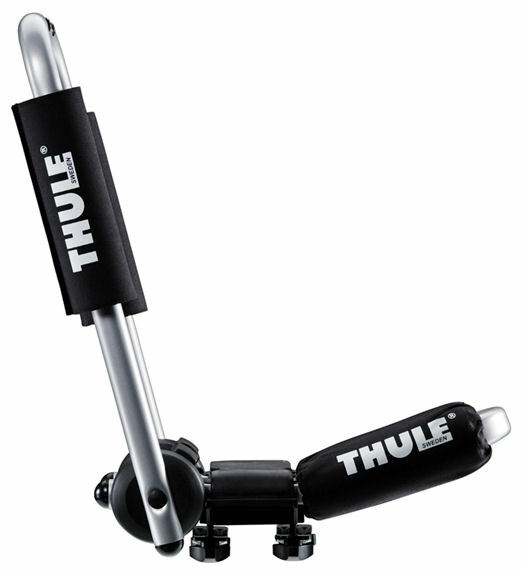 Hinges to allow it to be folded flat when not in use, avoiding the hassle of removing after use. 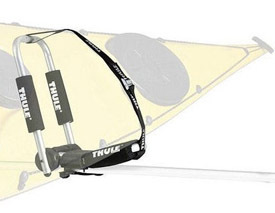 This special, stable design is aimed to make loading and transporting kayaks simpler. 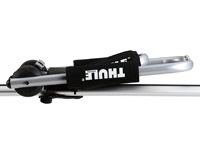 The Hull-a-Port Pro has built-in hinges which allows it to be folded flat when not in use. Padded bars to protect the kayak protect the kayak from scratches and damaged during loading & transit.